Whether you have lived in a home with neutral colors on the walls, or whether you have coated your walls with colors of the rainbow, covering it all with a fresh coat of paint applied by an Ann Arbor painter improves your chances of selling your home. Remember, people will be see your home in online listings and in person – you want the first impression to be memorable for good reasons. You need to de-personalize your home. Many realtors like to say, “People live in color. They buy in neutrals.” No matter how beautiful you believe your multi-hued color palette to be, buyers want to be able to imagine themselves in the space. And it helps to have a blank canvas with freshly painted, neutral walls in off-white, ivory, beige, or the like. You don’t want to spend a fortune. The last thing you want to do is put a bundle of money into a home that you’re not going to live in for much longer. Painting is affordable and it’s one of the most impactful home improvements you can make. For the quick home fix that pays off, trust a professional painter in Ann Arbor. A fresh coat of paint could be your ticket to a sale. You want an impressive entrance. Your front door is in good condition, but maybe it’s taken a beating from the Michigan weather, or maybe the color is just a little too quirky for the market. Take inventory of other homes in the neighborhood – those that are selling quickly and those that are not – and look at the colors of their front doors. Then choose an experienced Ann Arbor painter who will use the appropriate outdoor paint that will improve the curb appeal of your home. You don’t want to do any painting yourself. Painting is one of those tasks that sellers believe they can manage on their own, until they go to do the job. Selling a home is hard work; outsource all the painting tasks to professionals who can do the job in a fraction of the time it would take you. Your house needs to look newer and cleaner. Buyers can easily learn how old your house is, but just because your place has been around for a while that doesn’t mean it must look its age. A fresh coat of paint – inside or outside – will perk up your home so it looks new and fresh, covering up dirt, scratches, and scuff marks. Plus, neutral paint indoors will amplify the light and space of the home, and give it the appearance of a well-maintained space. Wallpaper can be a fun experiment, and it can be used to hide a host of sins. When you’re getting ready to sell though, this incredibly subjective wall covering needs to be properly removed, and the walls properly primed and painted so that they look new. An Ann Arbor painter has the experience and tools to manage what you might see as a tedious and impossible job. 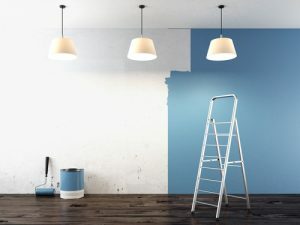 An experienced painter in Ann Arbor can offer you advice and suggestions about the best painting choices for your home, especially if you’re planning to sell. Contact Fine Line Painting, Ann Arbor painter, to discuss the interior or exterior paint jobs on your list.